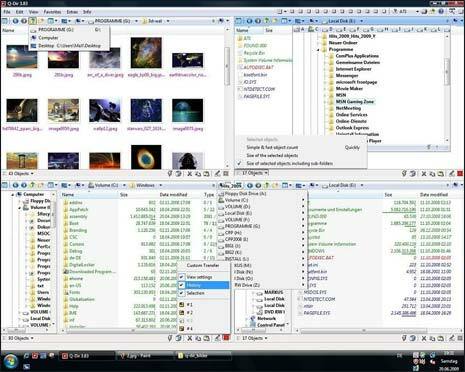 Windows Explorer pane is one of most useful place on Windows PC for bird’s eye view of all contents on the computer. By default, we can only open one Windows Explorer pane. We have already seen Windows Double Explorer program to open two Explorer panes. How about opening more (upto 4) Explorer Windows simultaneously in one view? Download Q-Dir (portable version), extract contents and launch it to view 4 Explorer Windows simultaneously on the screen. You can work independently within each pane and even interact with contents displayed in other explorer panes. It supports quick access, drag drop, screen magnifier, quick copy paste and lot of other features. If you got big widescreen display screen, then switch to multiple explorer mode using Q-Dir and do more in less time. You can get similar functionality by splitting browsing windows in Internet Explorer and Firefox browser. Splitting screen allows more content visibility is same space and hence higher productivity.